Get this best Social Media Marketing Plan template today and start developing your successful social media plan and campaigns! eDigital has benchmarked different social media marketing templates from top marketing consulting firms to social media agencies, taken some great insights and have created one single Master Social Media Plan Template for you. A good Social Media Marketing planning process forces you to articulate your key assumptions, define the metrics that matter, and align your marketing team around a shared Social Media Marketing strategy. Think of it as early detection: if done right and done well, it will help you to identify nascent flaws in your execution and strategy before it metastasizes into an actual social media crisis. This will be particularly important as you build out your social media team and ramp up spend, when making course corrections only become more difficult. Under this Social Media Marketing Plan, how many leads Social Media Marketing should generate (if any)? Does the Sales Manager share the same definition of a lead? What lead generation or sales-enablement efforts does Social Media Marketing Plan for? What category-creation/brand-marketing efforts should we activate via social media marketing? What social media marketing activities must I invest in in 2018 to lay the groundwork for 2019? Helps you keep track! This Social Media Marketing Plan template has been designed to help you present and track your marketing objectives, strategies and tactical executions in a nice manner and to get buy in from other stakeholders at your company. Why you need a Social Media Marketing Plan Template? THE STRATEGY. Before you start your social media activation, it is critical you and your team design the social media strategy for your brand. BRANDING ELEMENTS. In this section of the spread sheet, the template asks you to write down key information about your brand including: What issues/problems the brand is trying to solved? Unique elements brought to market: product features, range, delivery, customer service, rewards, program, convenience, cost saving. It will also asks you to define your brand mission, vision, values, language, design. BUDGET SPLIT. Specific cells for budget allocation per channel and actual spend so you can easily track progress of your spend. MONTHLY REPORT. Different cells for own media vs earn media. CAMPAIGN FLOW. You to map out all the social media activities to reach every single customer touch point within the Customer Purchase Journey. Below is our eDigital “Customer buying cycle” graph you could use to framework your Social Media content calendar by looking at each phase of the customer journey. CAMPAIGN TARGETING. A specific sheet to add specific targeting parameters to each of your social media campaigns. SOCIAL MEDIA CALENDAR. On this section of the spread sheet, you will be defining the top tactical social media activities you will be performing every month. WIP (WORK IN PROGRESS – LIST). When working with different team and on multiple projects, it is important to have a list of key social media activities/tasks you and your teams need to track and ensure they get completed. ENGAGEMENT BENCHMARK. A separate sheet for Social Media benchmark. Compare your engagement levels against your competitors. URL GENERATOR TOOL. Are you new to social media url tagging? 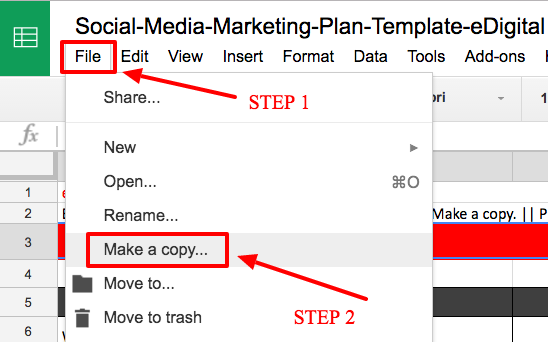 You will get a specific sheet to know how to add tagging parameters to all your social media urls. Just add few parameters and the tool will do the magic! WEEKLY POST LOG. Access an organised way to see what you or your team has posted during the week. LIVE STREAMS CALENDAR. A visual monthly calendar to pin point your live streams. Useful if you go live on Youtube, Facebook or Instagram. ACTIVATION IDEAS LOG. Everyone at your company has ideas. It is great to listen to them all and have a place to record them. Depending on your key objectives and top priorities, it is natural that some ideas will get actioned and others will have to wait. INSPIRATION LOG. You or your team members might find great inspirational social media posts on other social media accounts. This specific sheet allows you to log all those inspirational posts so you can always go back and make use of them. ✅ FREE Social Media Management Software Request for Proposal – 50 Questions you must ask your potential social media management software provide. Choosing a social media management solution can be tough, especially for larger organisations. You or your team may not know what different tools may offer or what functionality you even need. That’s why the social media experts at eDigital rounded up over 50 popular questions to include in your Social Media Management Software Request for Proposal. The sections are broken out by different solution functionality, and you can delete any item that isn’t a consideration for your organisation. You can also add lines for functionality not listed. Once you have decided what features and solutions your team needs, brand this document and send it to providers. If you have your own RFP template, just pull out all of the questions you thought were important and put them in your own document. ✅ FREE Hashtag Holiday Calendar. Whether you’re raising awareness for World Mental Health Day or celebrating your inner foodie with National French Fry Day, there’s a national holiday to link your brand to. Pro marketers like you rely on hashtag holidays to get people to engage, share content, promote a cause or celebrate. However, with the vast number of hashtag holidays celebrated across the globe, it’s difficult to know which version of the hashtags are correct and the most used. Access now the the most popular and accurate hashtag holidays for 2018. eDigital has cherry-picked a combination of generally celebrated, industry-specific and lesser known hashtag holidays and compiled them into the social media marketing plan template for you. ✅ FREE Live Streams Calendar. Facebook live streams and Instagram live videos have taken the world by storm. Make the most of them by keeping a schedule of what Live Streams you plan to cast through the month. You will adapt this Social Media Marketing Plan as you bring learnings and insights from your key social media metrics, sales data, marketing data and customers feedback, competitor review and observation and evaluation of your industry environment. Your Social Media Marketing team should be actively involved in the production and tracking of all the elements committed in your Social Media Marketing Plan. Assigning responsibilities in advance will clear up any questions to make sure everyone is on the same page. Last phase during the execution of your Social Media Marketing Plan is to ensure you are measuring progress, tweak template accordingly and have your success metrics ready to be compared with your initial baseline. Once you have a first draft of the plan, you should stress test the assumptions for achievability. For example, can you hire the number of people you are planning to hire? Have you factored in ramp up time? Have you factored in social media marketing training and/or software management and analytics costs? Have you factored in customer attrition? Eventually, a company is not a democracy, and planning is only useful if you make choices along the way. At the same time, you need to make sure your marketing team buy into your social media plan, including the key assumptions/metrics. And if they don’t really buy in, then you need to make the choice of changing the plan or letting them go. Annual Social Media Marketing planning, done well, is an opportunity to set the overall direction for your company, empower the team, and deliver clear SOcial Media Marketing leadership and best practices.